I’m sorry that it took me so long to pick up my review copy of this book, because it is excellent. I think what made me drag my feet was the title, which sounds like you’ll be thumbing a thicket of legal jargon. Far from it. Filmmaker-and-producer-turned-lawyer Thomas A. Crowell, Esq. writes in plain language and with generous humor. 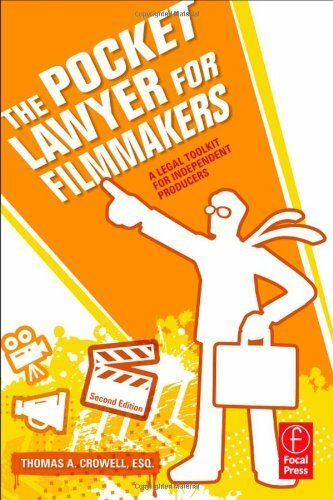 The book is more like a comprehensive movie business guide which also happens to contain explanations of the legal aspects of the industry. This is a heavy book. Ignore the “Pocket” in the title. Unless you are a circus clown, it will probably not fit in your pocket. Which is not to say the book is long-winded. It’s just jam-packed with information. (Dare I say more jam-packed than a car filled with circus clowns?) Crowell does a good job of boiling things down to essentials and then providing hypothetical examples that illustrate the points. One of the points about this book that shouldn’t be overlooked is just how well-organized it is. There are tabs printed on the side so you can quickly thumb through and find the topic you are looking for, which makes it great for reference, although I think most filmmakers will get a lot out of the book by reading it cover to cover. I certainly did. This book is not a substitute for a live entertainment lawyer. But it will definitely pay for itself many times over through avoiding long conversations with entertainment lawyers, especially if it keeps you out of court. It makes a good companion for a contract book, like Litwak’s Contracts for the Film & Television Industry. In short, this is a must-have book for independent movie producers and filmmakers who are serious about the business of filmmaking. Recommend. Disclosure: John Ott writes for MasteringFilm.com, a website affiliated with Focal Press, which also published this book. He agreed to review this book before that relationship developed.